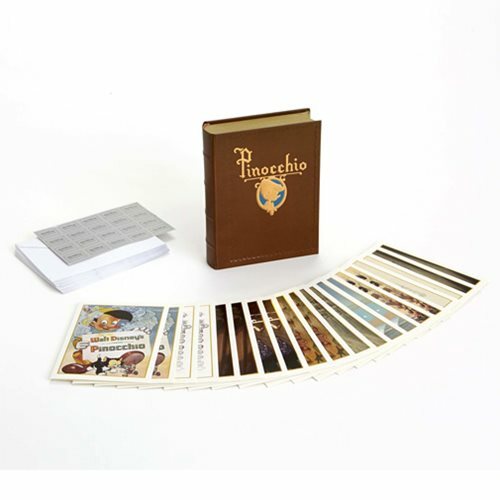 In a gift box inspired by the film's opening sequence, this Walt Disney Archives Collection Pinocchio Notecard Set includes 20 gold foil-embellished notecards (2 each of 10 designs), 20 envelopes, and 20 Walt Disney Archives Collection logo stickers to seal the envelopes. Images include rarely seen animation art, film backgrounds, character model sheets, a photo of Walt Disney with the Pinocchio marionette, and historical details. The story-book keepsake box has magnetic closure and embossed detail and measures about 8 1/2-inches tall x 6 7/10-inches wide x 1 9/10-inches deep.Ages 14 and up.